Topshop Unique London Fashion Week destroys it again! This time the focus is on Fall 2009. 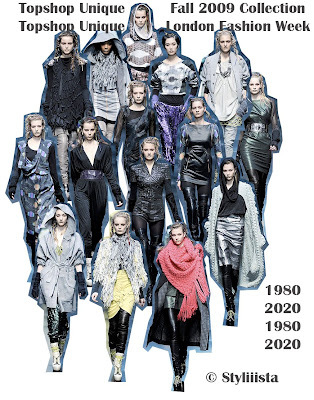 I labeled the title, "1980 vs. 2020" because it reminds me of the 1980's and what ' i love the 80's' fashion would resemble if we were in the year 2020. As we know it, everything moves in a circle. I am most interested in forward thinking, and futurism when it comes to design interpretation. And this set of looks I feel is aligned perfectly with the concept of 1980's and the future. Cheers!